How Dorothea Lange Taught Us To See Hunger And Humanity : The Salt Perhaps no one did more to show us the human toll of the Great Depression than Lange, who was born on this day in 1895. Her photos of farm workers and others have become iconic of the era. Documentary photographer Dorothea Lange had a favorite saying: "A camera is a tool for learning how to see without a camera." And perhaps no one did more to reveal the human toll of the Great Depression than Lange, who was born on this day in 1895. 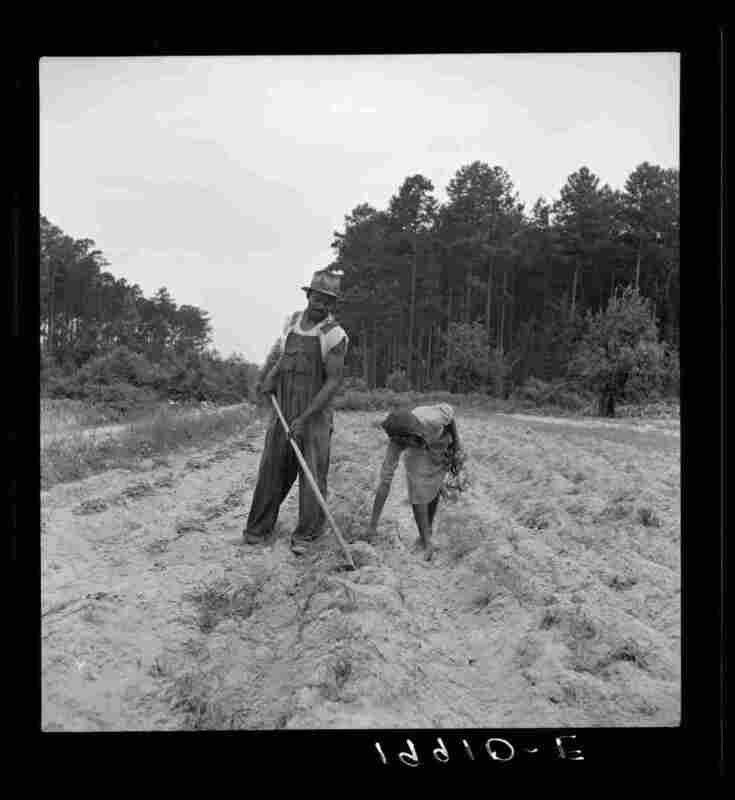 Her photographs gave us an unflinching — but also deeply humanizing — look at the struggles of displaced farmers, migrant laborers, sharecroppers and others at the bottom of the American farm economy as it reeled through the 1930s. Lange worked for the Farm Security Administration in the 1930s, chronicling rural poverty across America and the agency's efforts to provide relief. 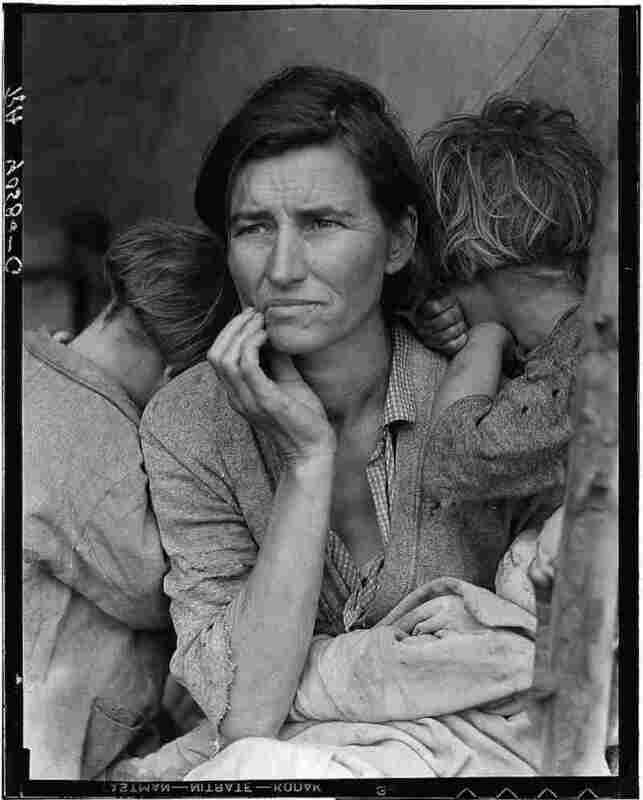 Her most famous photo is often referred to as "Migrant Mother." Shot in 1936 at a campsite full of unemployed pea pickers in Nipomo, Calif., the image features Florence Owen Thompson, a poor farmworker flanked by two of her seven children, while a third, a baby wrapped in burlap, rests on her lap. Freezing rain had destroyed the pea crop. Thompson and her kids "had been living on frozen vegetables from the surrounding fields, and birds that the children killed," Lange wrote in her notes. "She had just sold the tires from her car to buy food." But you don't need to read Lange's notes to sense this desperation. So much is conveyed in the worry etched on Thompson's face, worn far beyond her 32 years at the time the photo was taken. Before she began documenting the travails of the poor, Lange was a portrait photographer for the well-to-do in San Francisco. So she knew that images of individuals would have far more emotional impact than those showing barren landscapes, her biographer, Linda Gordon, told NPR in 2010. 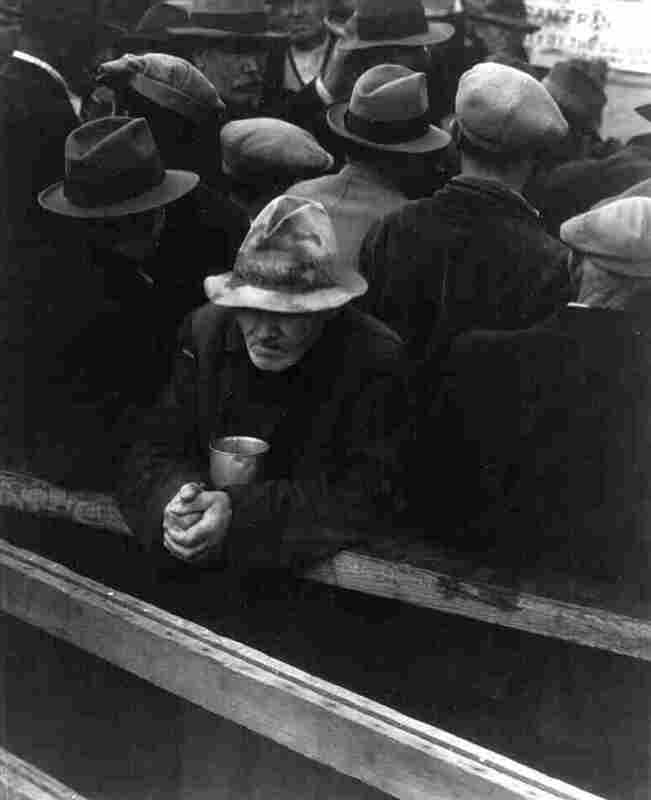 Some of Lange's early photos of the downtrodden include images of hungry, unemployed men in San Francisco's bread lines. 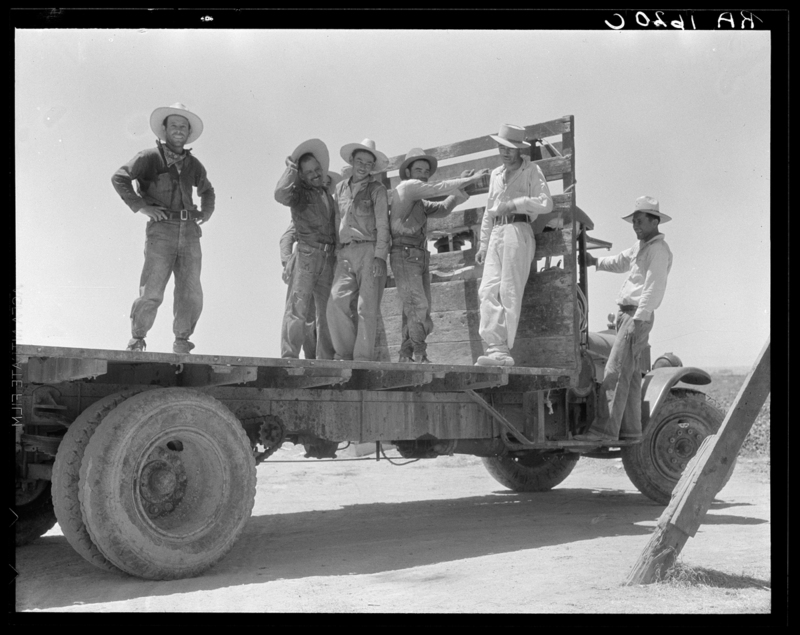 As Anne Whiston Spirn recounts in Daring To Look, her book about Lange's Depression-era work, Lange turned her lens to agricultural workers in early 1935, traveling to California's Imperial Valley. There, Spirn writes, Lange documented the situation of Mexican, Filipino and "white American" farm workers "living in hovels made of cartons, branches, and scraps of wood and cloth, with primitive privies, no waste disposal, no potable water." 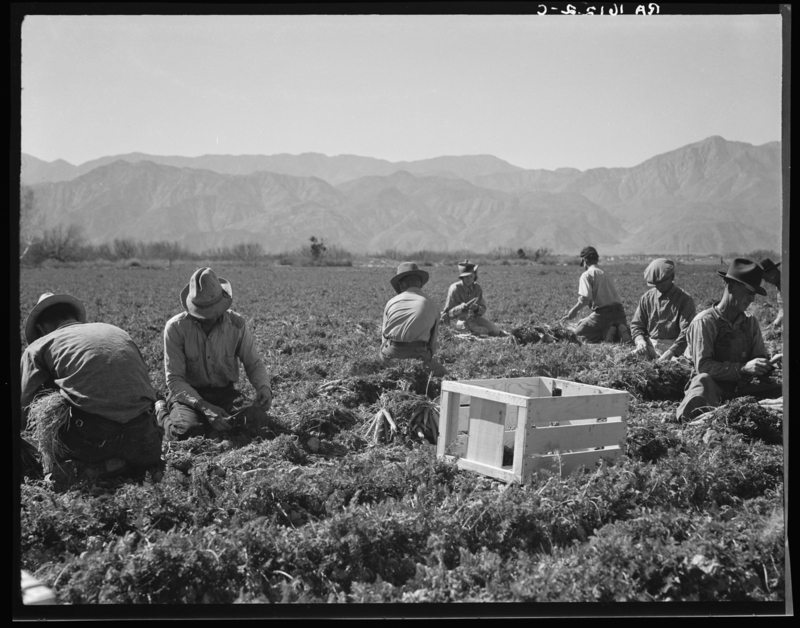 One of Lange's captions noted: "On these workers the crops of California depend." Later that year, Spirn says, Lange's images and field notes from the Imperial Valley helped sway officials to fund a camp for migrants in California. Throughout her career documenting the Great Depression, Lange took great pains to include detailed captions with her photographs. In her daybook, she jotted down facts about the people she captured on film, like how much they earned and paid for food, and the number and ages of their children, Spirn says. Lange also made it a point to engage her subjects in conversation, and her notes included direct quotes from these chats. 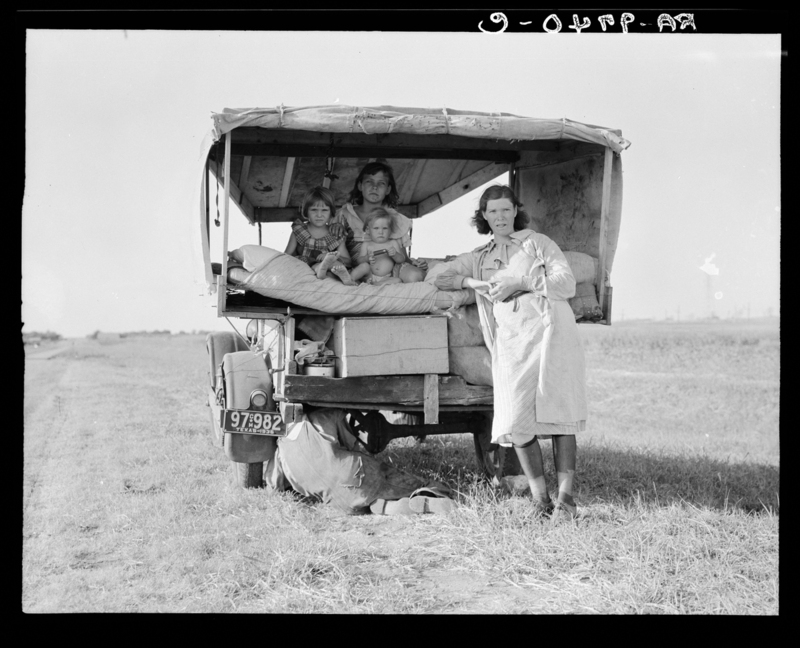 A family traveling between Dallas and Austin, Texas. "The people have left their home and connections in South Texas, and hope to reach the Arkansas Delta for work in the cotton fields," Lang wrote in her notes. "Penniless people. No food and three gallons of gas in the tank. The father is trying to repair a tire. Three children. Father says, 'It's tough but life's tough anyway you take it.' "
Lange once wrote that "half the value" of her fieldwork was in these captions. Yet as her images became more widely distributed, they were often published without these notes — a situation that made Lange "furious all of her life," according to Gordon. Even so, Lange well understood that photographs can speak a powerful visual language of their own. As she once said: "No country has ever closely scrutinized itself visually ... I know what we could make of it if people only thought we could dare look at ourselves."